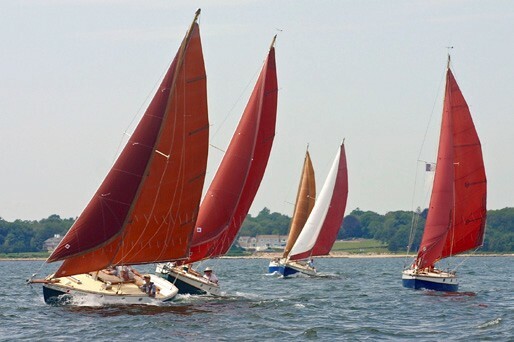 Saturday, August 15 was a spectacular day on Buzzards Bay, as iconic Stone Horse sloops raced off of Padanaram, MA for the sixth consecutive year. The wind was steady out of the southwest, blowing six to nine mph at the start and increasing to 17 for most of the 2015 Stone Horse Builder’s Cup. The race, which was sailed on a 5-nautical mile course over four legs, saw stiff competition between reigning champion Dave Kane’s Able of Newport, RI and newcomer David Neumeyer of Lynchburg VA, sailing Bob Gleason’s Metaphor, out of Wareham MA. Mutual respect was noted as Dave Kane responded, “David (Neumeyer) took full advantage of the boat and the conditions to challenge Able right to the very end of the course. 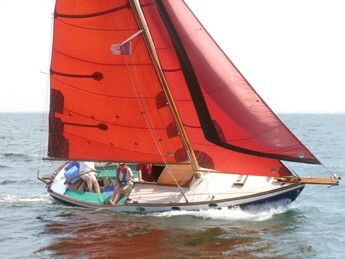 We had the advantage of a heavier crew allowing us to sail flatter and point higher, though I think that Metaphor was still sailing faster.” Kudos to Gordie Foye, age 9, the youngest crewmember in the fleet, who was “bailer extraordinaire” when Blue Jay, skippered by his mom Kristin Peterson of Freeport, ME, buried her rail on the final leg. After the race, skippers, crews and guests gathered on the lawn of the New Bedford Yacht Club for a barbecue, cocktails, presentations and conversations with old and new friends. The winning skipper, Dave Kane, and crew were presented with a half hull model of the Stone Horse crafted by Edey & Duff alumni Ed Pavao of New Bedford. A special thanks to Bill Ferguson, skipper of our spectator boat, Sea Fever, out of Padanaram, and Gregg Child, skipper of the committee boat, Tobias, out of Newport. The Builder’s Cup is a one-design race for the Crocker-designed Stone Horse, which was built by Edey & Duff of Mattapoisett, MA. 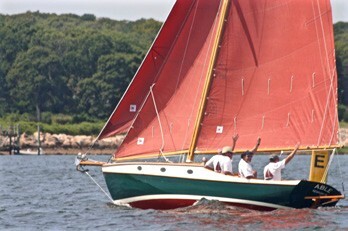 The race is hosted out of the New Bedford Yacht Club by club member and Dartmouth resident Tom Kenney, the owner of Hull #046, Windfall. Letter: Take a Vet Sailing!